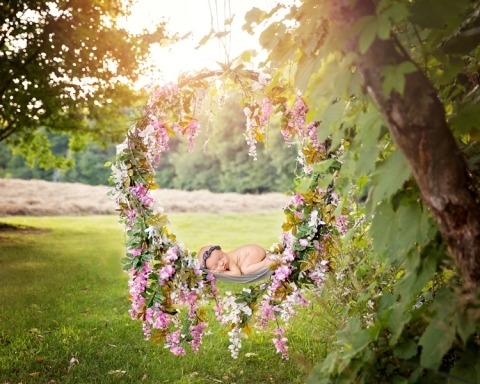 A big thank you to my friend, Crystal Sparks, of Crystal Sparks Photography for assisting me with her newborn session! She made the session so smooth and quick! 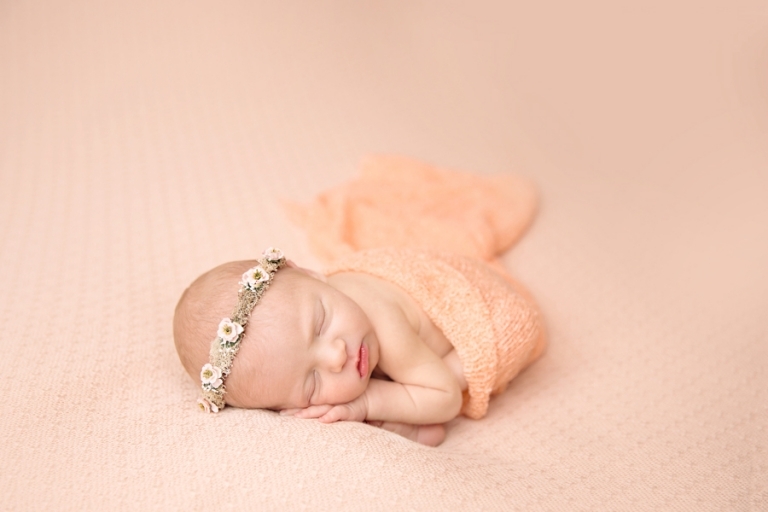 This peach color is a summertime favorite~ it’s girly and soft, absolutely perfect for Leah’s dainty little features. 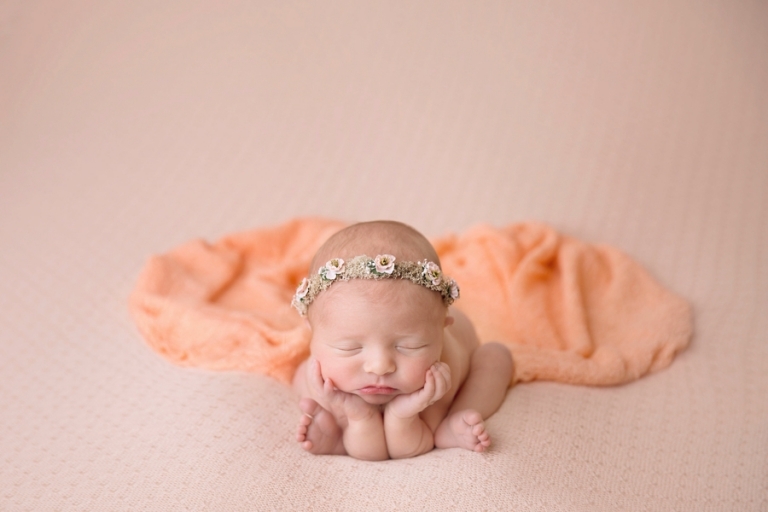 Backdrop and wrap are from Roses and Ruffles and this lovely tieback is from Baby Bliss Props. Hydrangeas are my favorite flower and ours happen to be blooming right now in our backyard. If you have been following the blog, you know neutrals and flowers are my favorite combination, so of course, this is one of my most favorite set ups! Leah was breach in utero, so we just had to do this froggie pose (*composite*- baby was supported the entire time). She was oh so comfy since this is how she spent her first 9 months! I get so many requests for the wreath props! Please keep in mind, baby never left the ground! Safety is always my number one priority! Leah’s nursery is pink and navy~ this tieback from Three Strands was the perfect fit! Occasionally I will pull out a backdrop, and they almost always from Intuition Backdrops by Becky Gregory. Thank you so much for stopping by! 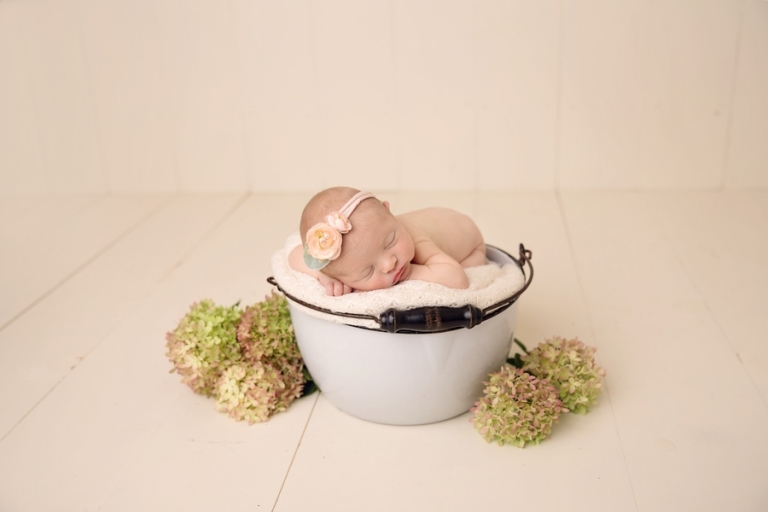 If you would like to learn more about newborn sessions, please visit the newborn session information page. To learn about the pricing options, please visit our pricing guide and portfolio. I’d love to create a custom session just for you~ you can reach me at mary@marychristinephotography.com to schedule your session!